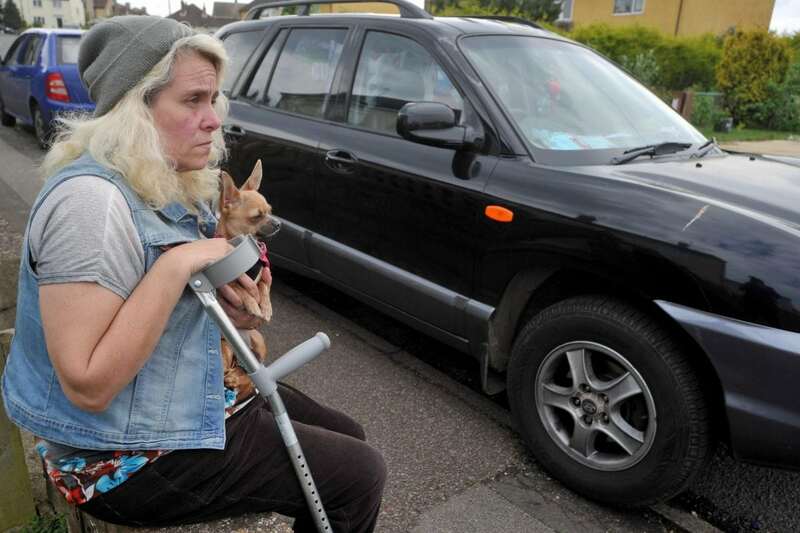 A former nurse claims she is being forced to live in her car and eat dog food because of swinging cuts to her benefits. Ann Cumberland-Quinn, 56, say she has struggled since her Personal Independence Payment (PIP) was stopped following a review in December. She was then dealt a further blow when her Employment and Support Allowance (ESA) benefit was slashed to £250 a fortnight from £375 in February of this year under government cuts. 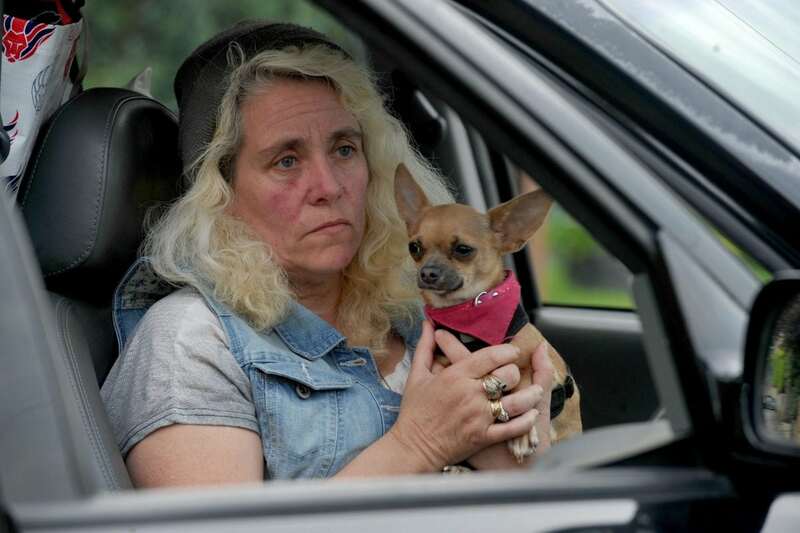 Ann has been living in her car on and off with her dog Chanel since losing her social housing bungalow in June 2015. She claims this was down to a mix up with her ESA payment she relied upon to pay the rent. Since then she has been left feeling overwhelmed by the prospect of finding a home, relying instead upon homeless shelters and the goodwill of strangers. Ann, who suffers from neuropathy and owns her own car, said she can no longer afford the costs of housing following the changes to her benefits. 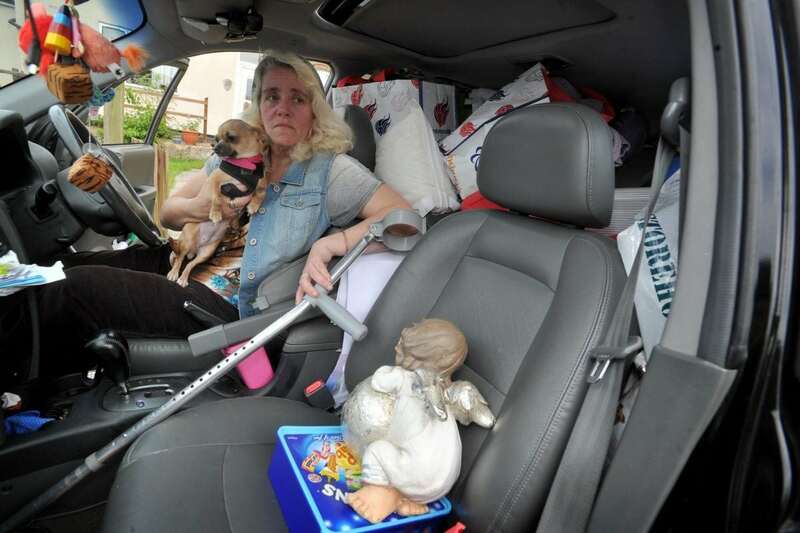 She says being of no fixed abode is also hampering attempts to find a home. “I want some money to live and I’m not living, I’m just existing. Before the cuts the ex-nurse, who once worked at The Princess of Wales Hospital, in Ely, Cambs., claims she received £550 in benefits. She now feels abandoned by the country’s welfare system and social housing provision. She is currently homed in her car in ely, Cambs., and previously lived in a bungalow in Mildenhall, Cambs. A spokeswoman from Department for Work and Pensions confirmed Ann no longer receives her PIP allowance and had her ESA reduced from February this year, but she still receives payments every two weeks. Angela Parmenter, housing and community safety manager from East Cambridgeshire District Council said: “Our housing team works with anyone in the district who is homeless or threatened with potential homelessness. Diane Abbot for home secretary OMG!!! It’s no good making silly comments, put your money where your mouth is and either give her shelter in your house or ask her for her bank details and send some money. Words are cheap and unimpressive! let her come and live with you then. This is just so wrong and Ann is just one person, there are so many more who don’t deserve to be existing like this and being ashamed of what has been forced upon them. Bring that May woman to meet the people who have their lives ripped out from under them because of benefit cuts. It’s plain evil. This should be in the papers, not smear campaigns against Jeremy Corbyn by the Murdoch owned press. Think this is a democracy? More like Big Brother brainwashing the public. Praying for some hope and a win for Corbyn. No, this woman can not work!!!!! And housing is beyond her budget. Maybe you should walk in her shoes? Wishing you bad karma!!!! what crap, my husband and I were living on 120 a week, that 5 less than she get for just herself. were weren’t living in a car and defiantly didn’t live on dog foo, trying to get the sympathy vote. i dont understand why she isnt getting housing benefit ? if you get esa you get housing benefit. Dave (you can work) I would like to see you work with incontinence on top of other problems, its a disgrace to treat Humans in this way. God help Humanity, let’s hope you don’t need it, or maybe it would humble you if it happened to you. I know there is a Catholic person from Italy receiving more than Ann is receiving. He goes to Italy on a regular bases. I will not be surprise if he is claiming benefit in Italy as well as in this country. He is also taking hash (illegal drug) 24 /7. I would like to know who is really assessing this person. a Catholic from Italy you say? Well, that narrows it down a bit! Cat food is more tasty. I don’t get this, why was she paying her social housing rent out of ESA payments? Why wasn’t she getting housing benefit? Housing benefit is paid direct to the landlord so you can’t get into arrears. ESA is supposed to be for everything else, it’s not for paying rent as well, it would never be enough. It’s disgusting she had to leave her home especially as she is not well. It makes me so angry! There is a SURPLUS in the national insurance pot and people are not being looked after. …their seeds for sale do not provide list of genes in contents lists…just like gov AG BIZ/USDA has denied 90+% of USA citizens demands for at least GMO on labels… It is war on our health by BIG GAS&OIL, BIG POISON PETRO CHEM in our air, water, foods and lands/soils. Healthcare insurance in USA is not healthcare, it is SICKOCARE monopoly monster madness care with BIG PHARMA and BIG VAXX being leading causes of death (excessive RX of mega harmful poison super addictive drug cocktails combos, and excessive invasive harmful tests, excessive harmful surgeries… SICKOCARE USA with most obscenely overpriced BIG PHARMA drugs here in the world and mental health is SOOO broken it’s mental illness on poison PETRO chemical psych MEDS that cause suicides and ABHORRANT violence! We do not want more SICKOCARE for All! We demand Holisitic Integrative healthcare for All!!! We need a platform that makes all TV ads for Big POISON PETRO PHARMA ILLEGAL… WE DEMAND FOODS THAT ARE OUR HERITAGE HEIRLOOM CERTIFIED ORGANIC FOODS AND FARMS… Regenerative AG transitions of millions of acres of crop and pasture lands to heirloom certified organic NOW! My heart aches for England and UK citizens who are being raped, looted, robbed, thrown out in the streets due to filthy dirty wealthy wars of austerities upon all the rest of us! Our sicko GOVS go to war terrorizing and bombing and genocides of BIZILLIONS of people for BIG OIL, BIG MILITARY, BIG POISON CHEM, BIG POISON PETRO PHARMA, BIG BANKS, BIG GMO, BIG PERVERTS SICKOS IN 666 SECRET SKULL AND BONES are POISON PYRAMID CAPITALISTS ECONOMIC GANGSTERS ON STEROIDS. Also gotta LOVE Russell Brand!!! Rise up for people, planet, peace over profits!